Tsugumi Okabe (email: tokabe@ualberta.ca) is a Ph.D. candidate studying Comparative Literature at the University of Alberta. She is undertaking her SSHRC-funded research on manga adaptations of British literary classics. Jane Austen has become a popular literary icon on a global scale. Her juvenilia and novels have been translated into several languages and adapted into films, television series, and even graphic novels. The emerging field of global Jane Austen studies, which maps out the “universal appeal of her work” (Huff), examines these various transcultural adaptations of Austen’s fictions. Within this field, scholars such as Eleanor Hogan and Inger Sigrun Brodey have drawn attention to Austen’s particular influence on Japanese literary and popular cultures, dating from the 1926 translation of Pride and Prejudice by prolific writer Natsume Sōseki (1867-1916) and the translation of Sense and Sensibility in 1947.1 Austen’s novels, imported during the Taisho Period (1912-1926), are believed to have “help[ed] guide Japan through its modernization and Westernization,” influencing writers such as Sōseki to address issues of the country’s “political disputes surrounding the connection between narration and nation” (Hogan and Brodey). Feminist writers, such as Nogami Yaeko (1885-1985), celebrated Austen as a subversive writer and were inspired by her radical ideas of women, domesticity, and marriage (Hogan and Brodey). Critical attention within global Jane Austen studies has generally been paid to Japanese translations and novel adaptations of Austen’s Pride and Prejudice, such as Sōseki’s Light and Darkness (Meian ), Kurahashi Yumiko’s The Bridge of Dreams (Yume no Ukihashi ), and Yaeko’s Machiko (1974).2 The popularity of Austen in recent years, though, according to Brodey, was “spurred by the success of the film versions of Sense and Sensibility (directed by Ang Lee) and Emma (directed by Douglas McGrath), released in Japan in 1996 and 1997, respectively” (16). These films have had a profound impact on the ways in which Austen is retold. Over the past decade in Japan, Jane Austen’s novels have been adapted in the medium of manga (Japanese comics), including Mori Kaoru’s Ema: A Victorian Romance (Eikoku Monogatari Ema [2002-06]), Hanabusa Yoko’s Emma (2011), Mochizuki Reiko’s Pride and Prejudice (Kouman to Henken ), and Sense and Sensibility (Bara no Koi Yori no Koi Funbetsu to Takan ).3 There have been few attempts to examine critically recent and popular adaptations of Austen’s works in the medium of graphic novels and manga, with the exception of several reviews of Nancy Butler’s graphic novel series—Pride and Prejudice (2010), Emma (2011), Sense and Sensibility (2011), and Northanger Abbey (2012)—and Inger Brodey’s essay on Mori Kaoru’s Ema. 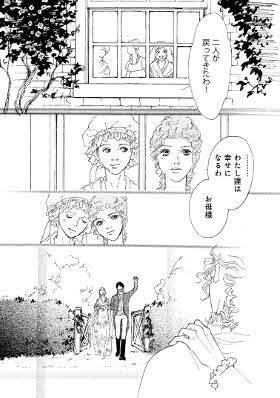 To the best of my knowledge, manga adaptations of Austen’s Sense and Sensibility have received no scholarly attention. Examining Mochizuki’s version of Sense and Sensibility against both Austen’s novel and Butler’s graphic version reveals the cultural variations in how Austen’s story is told as well as how Mochizuki’s manga adaptation simultaneously borrows and deviates from Austen’s novel to tell its own culturally relevant and original story. Mochizuki Reiko is a Japanese mangaka (manga artist) from Shizuoka, Japan. In 2009, Mochizuki published a manga adaptation of Jane Austen’s Pride and Prejudice (Kouman to Henken) followed by the publication of Sense and Sensibility (Bara no Koi Yori no Koi Funbetsu to Takan) in 2010. These manga adaptations retell Austen’s stories within the subgenres of manga that primarily target a female (youth) audience, shōjo and josei.4 Austen’s novels work well within the shōjo and josei genres, which tell relevant stories for the modern-day woman and reflect and respond to what Ogi Fusami describes as “the contemporary difficulties of women’s lives and their pleasures” (783) while simultaneously negotiating traditional Japanese values of femininity. Courtship, marriage, and unrequited love are as central to the shōjo and josei genres as they are to Austen’s novels. Mochizuki’s adaptation of Sense and Sensibility retells Austen’s story about the Dashwood sisters, their struggles, and their tribulations. However, the manga’s representation of the bonds of sisters, unlike the novel’s, is undermined by its goal of telling a love story, a purpose that ultimately puts at risk the manga’s feminist message of sisterhood. Austen’s feminism is thus complicated when adapted through manga, and the critical lens must be widened to encompass cross-cultural feminist debates. While the emphasis on romance and courtship in Mochizuki’s manga simplifies the novel’s thematic concerns, plot, and characters, it nonetheless enables Mochizuki to focus her narrative on the eldest sister, Elinor. Although that focus on Elinor offers an insightful interpretation of the ways in which sisterhood is constructed within a Japanese cultural context, Mochizuki’s Sense and Sensibility, by emphasizing the Dashwood sisters’ pursuit of love, loses the novel’s feminist critique of a patriarchal system that renders women economically powerless. Adaptations appropriate but simultaneously subvert the source text in significant ways to produce new meanings. Adaptations, especially those that adapt literary classics, have raised questions of authorship and originality and are consequently scrutinized on the basis of fidelity.6 Linda Hutcheon, however, posits that an adaptation is “a derivation that is not a derivative—a work that is second without being secondary. It is its own palimpsestic thing” (9). Fidelity, particularly as a criterion for evaluating manga and comic book adaptations of literary texts, is inadequate for analysis. Comic scholar Dirk Vanderbeke argues, “If a comic or graphic novel could indeed reproduce a novel faithfully and adequately, it would implicitly support the traditional hierarchy of the arts and undermine its own legitimacy and potential as a creative response to an aesthetic experience” (117). In this respect, both Mochizuki’s and Butler’s works blur the boundaries of “serious” and “popular” art by retelling Austen’s stories through image and text, redefining the canon of English literature in innovative and ironic ways.7 Both adapted versions of Sense and Sensibility employ distinct artistic styles to communicate the feminist message of their story. While an in-depth analysis that compares Mochizuki’s text to Butler’s text is beyond the scope of this essay, the following provides a brief comparison that illustrates the difference between Mochizuki’s and Butler’s esthetic choices. One of the striking differences between Mochizuki’s and Butler’s versions of Sense and Sensibility lies in how they articulate the feminist message through art. While Mochizuki sets up the reader for a love story, Butler’s graphic novel debunks conventions of the historical romance genre by drawing deliberate attention to its form and content.8 By doing so, Butler captures Austen’s satirical tone and, to some extent, mocks the harlequinesque elements of Ang Lee’s Sense and Sensibility. This tactic is evident in illustrator Sonny Liew’s artistic style, which Butler lauds as “lyrical” but also as “playful” in its use of the “chibi figures [to] enhance Austen’s humorous scenes” (Preface). The chibi (small or miniature) figures also complement the satiric tone of Nancy Butler’s prose. 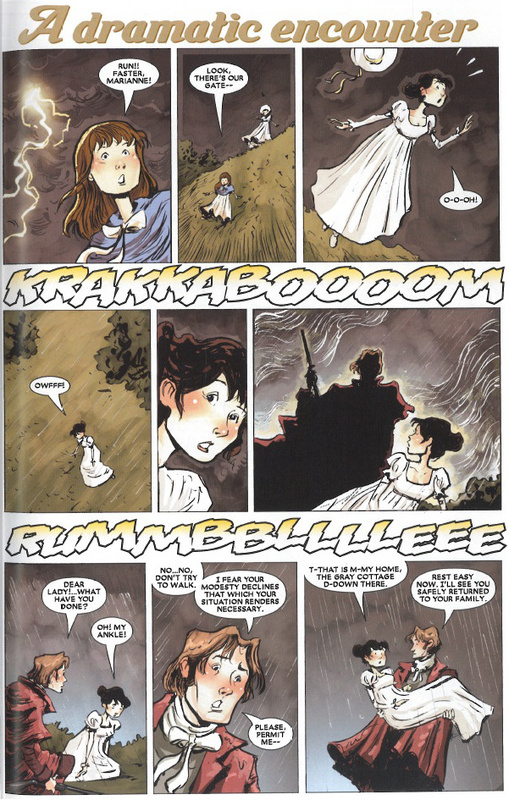 For example, when Marianne is rescued by Willoughby, the romantic ramifications of the scene are deflated by the large caption that appears at the top of the page: “A dramatic encounter.” The onomatopoeic “krakkaboom” and “rummbblllee” add to the hyperbolic effect of the scene, serving further to undermine the romantic encounter depicted in Lee’s film. From Nancy Butler’s Sense and Sensibility © MARVEL. This same scene in Mochizuki’s manga, however, depicts a more subtle encounter between Willoughby and Marianne. The close-up images of the characters’ faces convey their romantic attraction, emphasizing the idea of love at first sight. 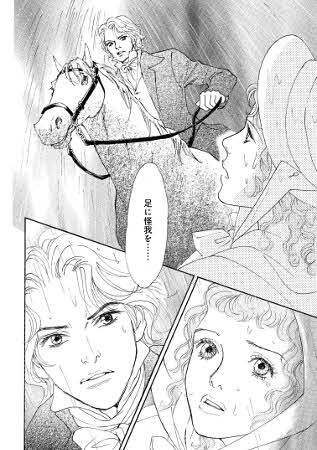 Willoughby, who comes to Marianne’s rescue on horseback, appears as the white knight (hakuba no ōji). Mochizuki’s Willoughby contrasts to the character’s depiction in Butler’s version as a hovering, dark shadow, a clue that the suitor may not be the hero. Sense and Sensibility. Romance Comics. In terms of esthetic style, particularly within the shōjo manga genre, Mochizuki’s characters are defined by their big eyes, idealized bodies, and homogeneous appearance, which together uphold a romanticized vision of the socialites of Regency England. Moreover, in Austen’s Sense and Sensibility, Marianne is described as having “sparkling eyes” (45) and Willoughby as possessing a “manly beauty” (43). These physical traits cater to the genre’s bishōjo (“beautiful girl”) and bishōnen (“beautiful boy”) esthetics, which glamorize stereotypically feminine and masculine characteristics by depicting women and men with idealized bodies. 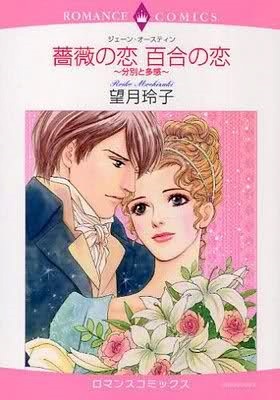 The representation of men as romantic heroes is also very much part of shōjo manga, and, as a result, characters such as Colonel Brandon and Edward Ferrars are revised in Mochizuki’s Sense and Sensibility. Her whimsical illustrations combined with Austen’s dialogue “invite the girl audience into the dreamy world” (Dollase 735) where sparkles and flowers conceal Austen’s criticism of her time. The soft pink pastel colors of the manga’s front cover, featuring two lovers gazing dreamily into each other’s eyes, foreshadow a tale about their romance rather than a story about sisters. Although Mochizuki employs the visual tropes of shōjo and josei manga, which seems to undermine the feminist message of Austen’s original, what makes Mochizuki’s manga original, particularly as a Japanese adaptation of Austen’s Sense and Sensibility, is her characterization of Elinor, who, in striking contrast to her sisters, informs the manga’s feminist message. Austen’s description of the Dashwood sisters at the beginning of the novel sets up a dichotomy whereby sense is designated to Elinor and sensibility to Marianne. Austen’s treatment of Elinor’s silence and reserve works well in a Japanese cultural context in which silence is praised as signifying ideas of female virtue and propriety. Elinor’s ability to restrain herself from displaying her emotions in public, such as when she weeps for Edward in private at the beginning of Volume II, translates well into a Japanese cultural context in which the public display of strong emotions is often discouraged. In this light, a Japanese audience might identify with Elinor more than with Marianne. Silence is one of the characteristics that distinguishes Elinor from Marianne, and it is also an aspect of Elinor’s character that has been reworked in adaptations of Sense and Sensibility. The effect of Elinor’s silence in Mochizuki’s manga is made clearer in comparison to Butler’s use of dialogue in her graphic novel. Although both comics and manga are visual media, the ways in which they employ dialogue and narration differ. The speech bubbles in Butler’s graphic novel are filled with text, indicating that her story relies on dialogue to move the plot forward. In the graphic novel, although Elinor speaks fewer words than her sister Marianne, her thoughts appear more frequently in speech bubbles than they do in thought bubbles, presenting her as a more verbal character than the one Mochizuki depicts. Mochizuki’s Elinor speaks very few words in comparison to Marianne, whose thoughts and desires are expressed and articulated in speech bubbles. Readers see Elinor developing as a character through her internal monologue. In addition to the use of thought bubbles, Mochizuki illustrates Elinor’s private thoughts in full-page spreads and by drawing attention to her facial gestures, mostly focusing on her eyes, to convey her feeling of shock, disbelief, and pain. One such example can be seen where Elinor is unable to tell Marianne about Edward’s engagement (not shown in Butler’s graphic novel). In a silent plea, Elinor expresses the depth of her heartache: “Marianne—if I told you everything there is to know—If I open up this wretched heart and showed you how I suffer” (72). This contrasting representation of character clearly shows the different ways in which Elinor is appropriated across cultures. As Ito Kinko contends, “the Japanese culture belongs to what American anthropologist Edward Hall calls ‘the high context culture,’ in which people prefer to use more implicit, unclear, and ambiguous messages whose meanings are found in context, rather than explicit, clear, and straightforward messages” (457). This form of communication is made clear not only in Mochizuki’s characterization of Elinor Dashwood. Mochizuki’s manga also relies more on visual techniques such as aspect-to-aspect panel transitions—a type of panel transition that “bypasses time for the most part and sets a wandering eye on different aspects of a place, idea or mood” (McCloud 72)—to convey the story through her characters and drawings.9 In other words, while Austen uses free indirect discourse to reveal Elinor’s thoughts, Mochizuki provides a visual representation of the dichotomies of sense/sensibility and restraint/ardor. The use of aspect-to-aspect panels is seen in other Japanese adaptations of Austen’s works, such as Kaoru Mori’s Ema. As Brodey notes, “what is particularly striking in Ema is the heroine’s near silence. Her intelligence is not conveyed through conversation, but rather visually” (27). This analysis of Mori’s Ema in relation to Mochizuki’s Elinor reveals how the heroines in both manga adaptations of Austen’s works tend to be silent but are not necessarily disempowered. One of the most compelling scenes that demonstrates the manga’s effective use of silence occurs when Elinor is weeping at Marianne’s bedside, a scene directly inspired by the Ang Lee’s film. Elinor at Marianne’s bedside in Ang Lee’s Sense and Sensibility. In a three-page spread that illustrates Elinor mourning for her ill sister, Mochizuki showcases Elinor’s love and devotion through close-up images of her eyes overflowing with tears. She silently cries, “Marianne, I finally understand. If you were not by my side I could not have endured all that I have. It is because of you that I am able to live like this” (100). This melodramatic scene highlights the story’s sentimentalism, which is often used in shōjo and josei narrative in order to invoke an emotional response in readers. Butler does sometimes employ similar visual techniques to represent Elinor’s feelings: for example, in the scene when Marianne falls ill with a fever, Elinor is seen covering her face with her hands in utter concern for her sister’s health. Mochizuki’s illustrations, however, tend to dramatize moments such as these because of the film’s influence on her work. More important, scenes such as these convey the story’s implicit feminism. Drawing on the work of Jane Tompkins, Dollase Hiromi Tsuchiya contends that in romantic fiction “female writers often made their political assertions in an indirect way; they delivered their political messages and feminism through emotional scenes in an attempt to cultivate in their readers a common moral standard through sympathy” (740). Both Ogi and Dollase have also remarked on the shōjo genre’s potential to undo conventional values of women in Japanese society: “this genre may help women to generate a space where they can amuse themselves as women and also consider their difficulties in reality in the process of pursuing a more satisfying, fulfilling way of life” (Ogi 783). Whether Mochizuki’s manga fulfills the genre’s potential by inspiring women to pursue a more satisfying lifestyle is uncertain: while the manga equates happiness to marriage, its demonstration of Elinor’s silence as compliance for the sake of her community rather than as a sign of her oppression is in line with the Japanese value for the collective. Mochizuki’s Elinor upholds what Abe defines as a cultural paradigm of silence and power. Marianne Dashwood is the romantic heroine of Austen’s Sense and Sensibility. She “‘does not approve of second attachments’” (55) and is convinced at the beginning of the novel that she “‘shall never see a man whom I can really love. I require so much!’” (18). Throughout the novel, Marianne demonstrates little restraint of her emotions—that is, until she “becomes a member of the community of sense” (Seeber, “I See” 225) at the end of the novel when she realizes the toll of her actions. Seeber points out that in Austen’s novel Marianne’s “individualism is renounced, and she is defined strictly in terms of her role as a member of society” (225). The individualism crucial to Western understandings of identity and self-worth, however, is less important within a culture rooted in collectivist ideology. Marianne’s reformation in the manga adaptation is a hopeful sign of the stability of her community and wider society. For this reason, Mochizuki’s Marianne is depicted as the troublesome younger sister who requires the attention and advice of her older sister in order to become a respectable member of society. In Mochizuki’s version, the duty of Elinor, as the eldest sister, is to nurture and guide her younger sister(s), even to prioritize their well-being and happiness over her own in order to maintain stability within her home. Marianne, whose emotional outbursts resist norms and values of a Japanese sensibility, functions to illuminate Elinor’s commitment to her duties as the elder sister. This older-vs.-younger-sister paradigm in the manga makes visible the hierarchal structure within Japanese families. In the film Elinor refers to Marianne as “dearest,” indicating a tender affection for her sister; in Butler’s graphic novel, Elinor refers to Marianne as “dearest sister” (n.pag. ); in both the film and the graphic novel, the sisters call each other by their first names. In the manga, however, Marianne refers to Elinor as onee-sama, or elder sister, and never by her first name. The honorific ending -sama in Japanese is used to indicate great respect for someone, but rarely do we use it to refer to our own siblings in private.11 These adaptations of Sense and Sensibility reveal cultural variations of how sisters interact with each other, but the formal name given to Elinor in the manga emphasizes the significance of her seniority to the Japanese audience. With such attention paid to Elinor and Marianne in both the novel and the manga, the youngest sister Margaret receives little in comparison. In the novel, Margaret is described as “the other sister,” who “did not, at thirteen, bid fair to equal her sisters at a more advanced period of life” (6). Because her age denies her access to private balls and drawing room gossip, she receives little acknowledgement. In Volume I, when Marianne slips and injures her ankle, Margaret is tucked away in the background for the sake of furthering the romantic plot between Willoughby and Marianne, her thoughtful gesture of leaving the gate open for Willoughby to carry Marianne to the house glossed over. Margaret does not join her sisters on their journey to London (115-16). Seeber contends that “in the story of war between sense and sensibility, there is no room for a third” (“I See” 232). Hudson posits, “Powerful sibling solidarity is restricted to two sisters because a close sororal bond is similar in many ways to a good marriage in Austen’s works” (128). While the novel’s portrayal of Margaret leaves but an impression of her existence, the film brings her character to life. In Ang Lee’s film, “[t]ransformed by Thompson from a plot device to an integral character, Margaret serves both to voice reasonable dissent and to exhort unpalatable truths from the mouths of her more restrained and practical-minded elders” (Samuelian 149). The film goes to some length to show how Margaret is part of the trio of sisters, such as when she is seen studying with Elinor, or when Elinor and Marianne help wash her hair. In recasting Margaret as a feminist, an implicit claim is made about the future of women in society.12 Margaret’s tree house in particular reveals how the film revises the novel’s feminist agenda. Her treehouse, suspended in the air, signifies her freedom and represents the unique space she occupies. Samuelian has argued that “Margaret’s house remains with her and becomes a symbol, not of patriarchal law, but of female mobility and independence” (149). Margaret’s voice resists patriarchal ideologies that confine women within a domestic sphere. She has ambitions to become a pirate—she has a sword fight with Edward, gets possession of an atlas, and demonstrates her knowledge of the world—hopeful signs of a changing future. In her graphic novel, Nancy Butler pays homage to Ang Lee’s representation of Margaret. In one scene, Margaret is engaged in a game of chess with Edward, who remarks, “You see that the queen, like all women, has the most power” (7), to which Margaret comments, “I quite like that notion” (7). Here Edward and Margaret are seen as intellectually equal, and Edward recognizes the potential for women in power. Butler’s portrayal of Margaret relies on the reader’s knowledge of the film to make sense of the feminist undertones of her adaptation. The final scene in the graphic novel, which depicts an image of Margaret and Edward wearing pirate caps, again pays homage to the film. Both Ang Lee’s and Nancy Butler’s representations of Margaret advocate ideas of gender equality missing in Mochizuki’s adaptation. In Mochizuki’s Sense and Sensibility, Margaret has an even less significant role than she does in the novel. Unlike the film’s proto-feminist Margaret, Mochizuki’s character is mainly an instrument to further the plot, such as when she tells Elinor about witnessing Willoughby cutting Marianne’s lock of hair. While in the novel Elinor doubts the validity of Margaret’s story, in the manga adaptation she takes her sister’s word and is relieved to hear confirmation of Marianne’s engagement to Willoughby. Although Elinor’s faith in Margaret’s observations indicates the trusting bond between the eldest and youngest sister, Margaret is generally cast aside since the story is concerned with Elinor’s and Marianne’s pursuit of love. Margaret is therefore excluded from their conversations. Marianne’s comment at the end of the manga that “we are all going to be happy, mother” (122) reveals her joy and relief at seeing Elinor finally engaged to Edward. However the “we” that Marianne speaks of is a reference to Elinor and her mother but not to Margaret, who is excluded from the panel. The focus on the two elder sisters and the mother, rather than Margaret, reinforces the idea that children are to be seen and not heard. Unlike the ways in which the film employs Margaret to promote a feminist message, Mochizuki’s Margaret signals an ambiguous future for women. One of the most striking differences between Austen’s and Mochizuki’s narratives is the absence of the Steele sisters and other female characters such as the Middletons, Mrs. Ferrars, and Miss Morton. In Austen’s novel, the Steele sisters offer a point of comparison and contrast to the Dashwood sisters. The relationship between Anne and Lucy Steele reveals the competitive nature of these sisters and their inattention to each other’s feelings, as in a drawing room conversation in Volume II in which Anne embarrasses Lucy in the presence of Elinor and Marianne when she hints, “‘I daresay Lucy’s beau is quite as modest and pretty behaved as Miss Dashwood’s’” (149). A comparable scene involving the Dashwood sisters occurs in the novel when Margaret is pressed by Mrs. Jennings to reveal Elinor’s love interest—a man whose “‘name begins with an F’” (62). Although Marianne in scolding Margaret is described as having done “more harm than good to the cause” (61), the difference between Anne and Marianne lies in their intentions. Where Marianne is genuinely concerned and “felt for [Elinor] most sincerely” (61), Anne shows little concern for Lucy’s feelings. The fragile bond between the Steele sisters is also manifest in their spying on each other. Lucy reveals her distrust of Anne, telling Elinor, “‘I am in constant fear of her betraying me’” (133). Indeed, two kinds of sisterhood emerge in Sense and Sensibility. As Glenda A. Hudson argues, “The ideal sister, like the ideal husband in Austen’s works, is a caretaker and a teacher figure” (129). Susan Lanser points to “evil” sisters such as Fanny Dashwood and the Steeles, who “are often signaled by [their] lack of sisterly concern” (54). According to Hudson, sisters like Elinor and Marianne “creat[e] an exclusive, enclosed circle; family ties are drawn tighter, and the home is invigorated” whereas sisters like Lucy and Anne “create evil and disorder” and “threaten family coherence and integrity” (127). In Butler’s graphic novel, both Lucy and Anne are included in the narrative, but the quality of their bond as sisters is unclear since issues of trust between them are not made explicit. In one scene, Anne complains about the lack of “genteel young men in Devonshire” (n.pag.) and, as in the novel, is scolded by Lucy who comments, “Lord, Anne, can you talk of nothing but beaux? You will make Miss Dashwood believe you think of little else” (n.pag.). In another scene, Lucy tells Elinor to “pay [Anne] no mind” (n.pag.). In both instances, although Lucy’s dismissive attitude towards Anne hints at the animosity between the two sisters, their presence in the graphic novel does not seem to provide a counter-model of sisterhood as in Austen’s novel. Mochizuki’s version of Sense and Sensibility, like Ang Lee’s film adaptation, blurs the distinction between good and evil sisters by featuring solely Lucy (and eliminating Anne). Thus, the dynamic between the Dashwood sisters and the Steele sisters is lost, and without a point of comparison, the manga diminishes the significance of the Dashwoods’ model sisterhood. Mochizuki, however, still upholds Elinor as the dutiful eldest daughter, depicting her as the ideal sister and moral voice of the story. While the feminism of Jane Austen’s Sense and Sensibility is concerned about how women are economically disenfranchised, Mochizuki’s manga encourages a reading of the story in terms of romantic fantasies and female wish fulfillment. The novel begins by drawing out the logistics of how property and fortune are passed down from father to son. From the novel’s onset, Austen emphasizes the importance of money matters. Edward Copeland argues that Austen is critical of how women are “severely handicapped by law and custom from possessing significant power over money” (129). As a consequence, in a society that privileges the male as “the legal inheritor” (SS 3), women seek marriage as a means of economic stability, social security, and survival. By drawing attention to Elinor and Marianne’s limited social mobility as a result of the law of primogeniture, Austen critiques a patriarchal society that renders women financially dependent on men. Here, Elinor draws attention to the social inequality between men and women, but this critical voice that is present at the beginning of the manga is lost as the story progresses and focuses more on Elinor’s romantic interests in Edward. The romance qualities emphasized in the manga adaptation outweigh moments of Elinor’s empowerment, complicating the manga’s feminist message. In Sense and Sensibility, Austen critiques the patriarchal family, drawing attention to John Dashwood’s incompetence and his failure as a brother to provide for his sisters. Butler’s adaptation appropriates Austen’s portrayal of John Dashwood. The last panel on the first page of the graphic novel shows John Dashwood comforting his dying father: “You may rest easy, father. I will do everything in my power to make sure they are . . . comfortable” (n.pag.). John’s hesitation renders his intentions toward the Dashwood women questionable. Moreover, the juxtaposition of this scene with the first panel on the second page, featuring Mrs. John Dashwood moving into Norland estate followed by maids and butlers carrying her belongings, further undermines John’s promise to his father. In contrast, in the manga adaptation, John is absent from his father’s bedside, and there is no promise to take care of the Dashwood women. Moreover, by rendering John Dashwood almost powerless under Fanny’s influence, Mochizuki casts him in a sympathetic light. John Dashwood, unlike in Austen’s novel or even Butler’s graphic novel, is for the most part absent in the manga; instead, Mochizuki emphasizes Fanny’s role as the villainous sister-in-law responsible for the Dashwoods’ dispossession from the Norland estate. The implicit claim that women are to blame for the oppression of other women, rather than drawing attention to a patriarchal system that renders women economically dependent on men, contributes to an anti-feminist reading of Austen’s story. As Mochizuki’s manga “harlequinizes” the novel, small but significant details about the Dashwood women’s struggle to make ends meet, mentioned in the novel and developed in both Lee’s and Butler’s adaptations, are omitted. In Austen’s novel, Marianne is persuaded to decline the horse given to her by Willoughby, as the narrator reminds us that if her mother “were to alter her resolution [to keep no horse] in favour of this gift, she must buy another for the servant, and keep a servant to ride it, and after all, build a stable to receive them” (58), none of which the Dashwood women can afford. In Ang Lee’s adaptation, Elinor takes on the responsibility to budget her family’s expenses, at one point stating, “We have to economize,” drawing attention to the family’s financial struggle to afford “beef as well as sugar.” In Mochizuki’s manga, both of these instances disappear, and any indication of the Dashwoods’ “poverty” is erased. Mochizuki’s manga avoids depicting the Dashwood women living unhappily within their home. Rather, their home is a place of comfort, romance, and melodrama, and the weight of their financial concerns is easily forgotten. Mochizuki’s adaptation is not concerned with the economic struggles of women of Austen’s time, less focused on the financial benefits of the sisters’ marriages than on their romantic aspects. The last page of the manga further confirms this reading by featuring a double-page spread of Elinor and Marianne dressed in fancy gowns and happily married to their respective partners. While, according to Emily Auerbach, “Austen ends her novel about the prevalence of cold, selfish, dull people bickering over money and status with the image of a close-knit family” (275), in Mochizuki’s manga there is no promise of the sisters’ bond beyond marriage. In the fictitious world of Mochizuki’s Regency England, which is inhabited by beautiful people who attend balls and go on leisurely picnics, issues of economic privilege are erased, leaving the reader with an impression of the luxurious lifestyle of the gentry. To match the elegance of Mochizuki’s England, elements of Austen’s novel are altered to maintain a “picture perfect” image of the patriarchal family. In Austen’s Sense and Sensibility, the patriarchal family, as Johnson has argued, “tends to be the locus of venal and idle habits” (55), but in Mochizuki’s manga (unlike Butler’s fairly “faithful” version) the patriarchal family is a symbol of social stability. 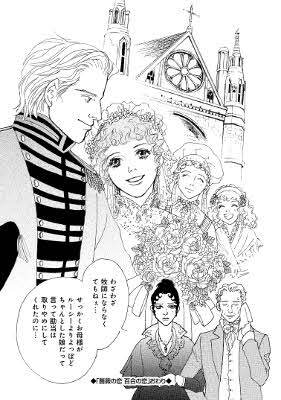 Colonel Brandon’s story of Eliza, for example, demonstrates how themes of family and kinship are treated differently in the novel and in its manga adaptation. In the novel, Colonel Brandon testifies, “‘At seventeen, [Eliza] was lost to me for ever. She was married—married against her inclination to my brother. . . . My brother did not deserve her; he did not even love her’” (205). In Austen’s novel, the family is in ruins. In contrast, in Mochizuki’s version, Colonel Brandon states that he and Eliza “grew up together since childhood. Our affection for each other developed as we grew up. We were separated by my father’s orders. She was forced to marry another man” (88). Here, Mochizuki specifically uses the Japanese word 男性 (dansei), meaning man, but the furigana (the words written on the right side of the kanji) reads ひと (hito), which means person. The fact that Colonel Brandon’s brother, who is specifically mentioned in Austen’s text, is altered to the generic “man” underplays Eliza’s tragic fate at the hand of the Colonel’s father and brother. Moreover, while in Austen’s novel Eliza was forced to marry because her “‘fortune was large’” (205), Mochizuki omits this detail, dismissing economic motives. Mochizuki paints an image of ideal family units, and while that depiction invokes cultural values of honor and respect within the family, it ultimately reinstates the patriarchal order that Austen criticizes. Furthermore, the manga’s omission of Austen’s criticism of the patriarchy enables its emphasis on romance. This alternation is exemplified in Mochizuki’s transformation of Colonel Brandon into a hero, a characterization directly taken from the film adaptation. The iconic scene in the film in which Colonel Brandon rescues Marianne occurs in neither Austen’s novel nor Butler’s graphic novel, but it is incorporated into Mochizuki’s adaptation. By refashioning Colonel Brandon as Willoughby’s virtuous double, the film “remakes Brandon into a standard-bearer of true emotion” (Nixon 39) and “as a believable substitute for the youthful, vigorous, and emotionally expressive Willoughby” (41). Mochizuki specifically recasts Ang Lee’s Brandon, catering to the shōjo depiction of the romantic hero—not one who suffers from physical ailment or “‘rheumatic feel in one of his shoulders’” (SS 38) but who instead is able to take on the role of the knight in shining armor, rescuing Marianne from a close encounter with death. And by portraying Marianne as the damsel in distress, the manga renders her as an object of male desire requiring the protection of multiple suitor(s). Brandon’s rescue of Marianne in Ang Lee’s Sense and Sensibility. 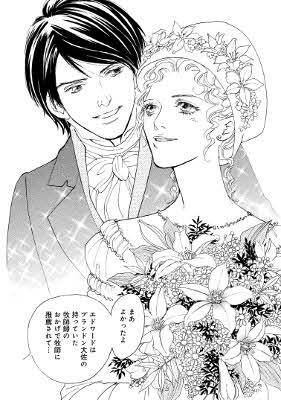 Edward Ferrars is also portrayed as more amiable in the manga than in either Austen’s characterization or Butler’s version, making him more suited to the harlequin and shōjo style. Butler’s graphic novel incorporates details from the novel that illustrate Lucy’s engagement to Edward, such as the lock of hair, and the “portrait as a keep sake” (n. pag.). In the manga adaptation, Edward’s secret engagement to Lucy Steele is treated as a fabricated story sprung from her admiration for him. Mochizuki leaves out the physical evidence of the lock of hair, portrait, and handkerchief—symbols of Edward’s promised union to Lucy—suggesting an ambiguity in his relationship with her. Although readers familiar with the pretext may be suspicious of Edward, Mochizuki, by omitting these details, preserves Edward as the ideal and flawless hero. The shōjo genre appeals to readers who anticipate love stories, and Mochizuki’s manga adaptation, in particular, caters to an audience that expects happy endings through marriage. By emphasizing the story of Elinor’s and Marianne’s pursuit of marriage, the manga adaptation, like many of the film adaptations of Austen’s works, privileges “passion over sisterly devotion [that] may well reflect a twenty-first-century audience’s greater interest in love stories” (Wells). By employing themes of courtship and romance in a non-ironic way, Mochizuki invites her readers to escape into a world of romantic hopes and dreams. Austen’s story transcends cultural borders and language barriers through the universal appeal of sisterhood and romance. Whether “characterized by her elegant domesticity and intelligent rendering of local detail and eccentric personalities” (Hogan and Brodey) as exemplified in the works of Sōseki, or whether represented as a “a rebellious feminist, evoking universal concerns and engaged in social commentary” (Hogan and Brodey) as seen in Nogami’s works, Austen, as Kaplan has pointed out, has “engaged . . . successive generations of readers because of [her novels’] interpretive richness” (184). The multiple adaptations of Austen’s work since the Meiji Period attest to such a claim. Mochizuki’s manga adaptation is not just an amalgamation of both the novel and the film. Instead, Mochizuki rewrites an English past for a contemporary Japanese audience to articulate a counter-feminist discourse through the character of Elinor, who challenges assumptions about Japanese women and silence. In doing so, Mochizuki tells a heartfelt story of the trials and tribulations of sisters, Elinor and Marianne, appealing to a Japanese sense and sensibility. 1. See Ebine Hiroshi, Amano Miyuki, and Hisamori Kazuko’s “Jane Austen in Japanese Literature: An Overview.” All Japanese names are written with the surname preceding the given name, with the exception of Natsume Sōseki, referred to by his penname, Sōseki. 2. See Hogan and Brodey, Aoyama and Satoh for critical analysis of these texts. 3. A Rose’s Love and a Lily’s Love: Sense and Sensibility. Mochizuki Reiko’s Sense and Sensibility is unavailable in English, so the Japanese-to-English translations are my own. The panels in Mochizuki’s manga are read from right to left. 4. Shōjo means (young) girl; josei means woman, or mature lady or woman. Both shōjo manga and josei manga are targeted to a female reading audience, but they deal with themes of love, romance, and courtship in slightly different ways. Shōjo usually portrays an idealized romance (the story usually is about the protagonist’s first love, naivete, innocence) whereas josei usually depicts a mature kind of romance and can be more sexually explicit. 5. Kaplan specifically refers to cinematic adaptations of Austen’s works, showing how the sophistication of Austen’s characters is diminished to ensure the commercial success of the film, a revision that, she argues, undoes Austen’s feminist critique. Since, like manga and graphic novels, film is a visual medium, Kaplan’s notion of “harlequinization” (178) provides a useful framework for analysis. 6. Several critics have commented on issues of fidelity. See, for example, McFarlane, Stam, and Vanderbeke. 7. The dialogue in Butler’s graphic novel at times is taken directly from Austen’s novel; however, in her introduction she also says, “I hope readers will forgive me taking some liberties—in the creation of speeches where none existed and the fleshing out of scenes Austen merely hints at in the book, . . . including Edward’s proposal to Elinor, which just had to take place on the page!” (Preface). 8. Although Mochizuki’s manga adaptation of Sense and Sensibility lacks a degree of irony, her earlier works, such as her adaptation of Pride and Prejudice, showcase her playfulness, wit, and humor. The sleeve (sode) of the manga adaptation promotes Julian Jarrold’s Becoming Jane (2007), starring Anne Hathaway, but Mochizuki’s characters are in fact heavily influenced by Simon Langton’s BBC television series, Pride and Prejudice (1995). Mochizuki’s characterization of Mrs. Bennet, though it pays homage to Alison Steadman, is ultimately that of a selfish and hysterical character who is unlike Austen’s original. The exaggerated facial expressions and her incorporation of witty dialogues, which add irony and humor to the narrative, work toward creating a comical story about the trials and tribulations of love and romance. 9. According to Scott McCloud, “aspect-to-aspect transitions have been an integral part of Japanese mainstream comics—most often used to establish a mood or a sense of place” (81). 10. For example, upon hearing the story that Colonel Brandon has once had his heart broken, Elinor is the only one who sympathizes with him, calling him “poor Brandon” (42) and wondering, “Is that why he always seems so sad?” (42). 11. That is, unless one belongs to a traditional Japanese household or one that is very wealthy, in which case a degree of formality is expected among family members. Mochizuki employs this kind of language to imitate the gentry society that Austen depicts in her novel. The Japanese equivalent of the English word “dearest” is sai ai (na), and it is more often used in writing than in speech. It is also rarely used to describe a relationship between siblings; it more commonly describes a relationship between a husband and wife, or lovers. Older sisters are called onee-san or ane-ue (polite and formal). Mochizuki’s personal experience as an elder sister may have influenced her understanding of “sensibility” and shaped the overall tone of her story. In the Afterword Mochizuki reveals, “I also have a younger sister who has helped me overcome many of my life’s trials. And as I was creating this manga, I found myself cheering on Elinor and Marianne” (n.pag.). 12. Yet Ang Lee’s film is not as critical of how the society of the time privileges men since the film downplays the details of their disenfranchisement as merely “the law,” and, as Johnson points out, it is not that women were not able to own property (149). Abe Hideko Nornes. “From Stereotype to Context: The Study of Japanese Women’s Speech.” Feminist Studies 21 (1995): 647-71. Auerbach, Emily. “An Excellent Heart: Sense and Sensibility.” Bloom’s Modern Critical Views: Jane Austen. 2nd ed. Ed. Harold Bloom. New York: Infobase, 2009. 251-77. Austen, Jane. Sense and Sensibility. Ed. R. W. Chapman. 3rd ed. London: Oxford UP, 1933. Aoyama Tomoko. “Jane Austen and Kanai Mieko: Comic Sisterhood.” Hecate 34.2 (2008) 5-17. Brodey, Inger Sigrun. “Ema: The New Face of Jane Austen in Japan.” Japan Studies Review 15 (2011): 7-34. Butler, Nancy. Sense and Sensibility. New York: Marvel Characters, 2010. Copeland, Edward. “Money.” The Cambridge Companion to Jane Austen. 2nd ed. Ed. Edward Copeland and Juliet McMaster. Cambridge: CUP, 2011. 144-58. Dollase Hiromi Tsuchiya. “Early Twentieth Century Japanese Girls’ Magazine Stories: Examining Shojo Voice in Hanamonogatari (Flower Tales).” Journal of Popular Culture 36.4 (2003): 724-55. Ebine Hiroshi, Amano Miyuki, and Hisamori Kazuko. “Jane Austen in Japanese Literature: An Overview.” Persuasions On-Line 30.2 (2010). Huff, Marsha. “Message from the President.” Persuasions On-Line 28.2 (2008). Hudson, Glenda A. ‘“Precious Remains of the Earliest Attachment’: Sibling Love in Jane Austen’s Pride and Prejudice.” Persuasions 11 (1989): 125-31. Hogan, Eleanor J., and Inger Sigrun Brodey. “Jane Austen in Japan: ‘Good Mother’ or ‘New Woman’?” Persuasions On-Line 28.2 (2008). Ito Kinko. A History of Manga in the Context of Japanese Culture and Society.” Journal of Popular Culture 38.3 (2005): 456-75. Kaplan, Deborah. “Mass Marketing Jane Austen: Men, Women, and Courtship in Two Film Adaptations.” Jane Austen in Hollywood. Ed. Linda Troost and Sayre Greenfield. Lexington: UP of Kentucky, 1998. 177-87. Lanser, Susan Snaider. “No Connections Subsequent: Jane Austen’s World of Sisterhood.” The Sister Bond: A Feminist View of Timeless Connection. Ed. Toni A. H. McNaron. New York: Pergamon, 1985. 51-67. Lee, Ang, dir. Sense and Sensibility. Mirage/Columbia, 1995. Leitch, Thomas M. Twelve Fallacies in Contemporary Adaptation Theory.” Criticism 45.2 (2003): 149-71. McCloud, Scott. Understanding Comics: The Invisible Art. New York: Harper, 1993. McFarlane, Brian. Novel to Film: An Introduction to the Theory of Adaptation. Oxford: OUP, 1996. Mochizuki, Reiko. Bara no Koi Yuri no Koi Funbestu to Takan. Tokyo: Ohzora, 2010. Nixon, Cheryl L. “Balancing the Courtship Hero: Masculine Emotional Display in Film Adaptations of Austen’s Novels.” Jane Austen in Hollywood. Ed. Linda Troost and Sayre Greenfield. Lexington: UP of Kentucky, 1998. 22-43. Ogi Fusami. “Female Subjectivity and Shoujo (Girls) Manga (Japanese Comics): Shoujo in Ladies’ Comics and Young Ladies’ Comics.” Journal of Popular Culture 36 (2003): 780-803. Samuelian, Kristin Flieger. “Piracy is Our Only Option.” Jane Austen in Hollywood. Ed. Linda Troost and Sayre Greenfield. Lexington: UP of Kentucky, 1998. 148-58. Satoh, Aya. “Caught Between Old and New: The Changing Face of Marriage in Austen and Tanizaki.” Persuasions On-Line 28.2 (2008). Seeber, Barbara K. “A Bennet Utopia: Adapting the Father in Pride and Prejudice.” Persuasions On-Line 27.2 (2007). _____. “‘I See Every Thing as You Desire Me to Do’: The Scolding and Schooling of Marianne Dashwood.” Eighteenth-Century Fiction 11.2 (1999): 223-34. Stam, Robert. “Beyond Fidelity: The Dialogics of Adaptation.” Film Adaptation. Ed. James Naremore. New Brunswick: Rutgers UP, 2000. 54-76. Vanderbeke, Dirk. “It Was the Best of Two Worlds, It Was the Worst of Two Worlds: The Adaptation of Novels in Comics and Graphic Novels.” The Rise and Reason of Comics and Graphic Literature: Critical Essays on the Form. Ed. Joyce Goggin and Dan Hassler-Forest. Jefferson: McFarland, 2010.